Several years ago I visited the Netherlands in the spring. I was entranced with the flower fields full of color; the open, flat landscape, and the moody weather that blustered and brooded, then blazed with sunshine. Here the earth and sky met very gently where the morning mist lifted off a canal. The horizon line is a significant element in my work as it is the place where infinite open space meets finite earth. The horizon line is a lovely metaphor for our human reaching for the divine, an underlying theme throughout my work. “For every house is built by someone, but He who built all things is God” Hebrews 3:4. Buildings have been a favorite subject in my work for many years. They speak of the human element in the landscape. My art truly lies somewhere in the dichotomy between narrow, domestic scenes and expansive, natural landscapes. 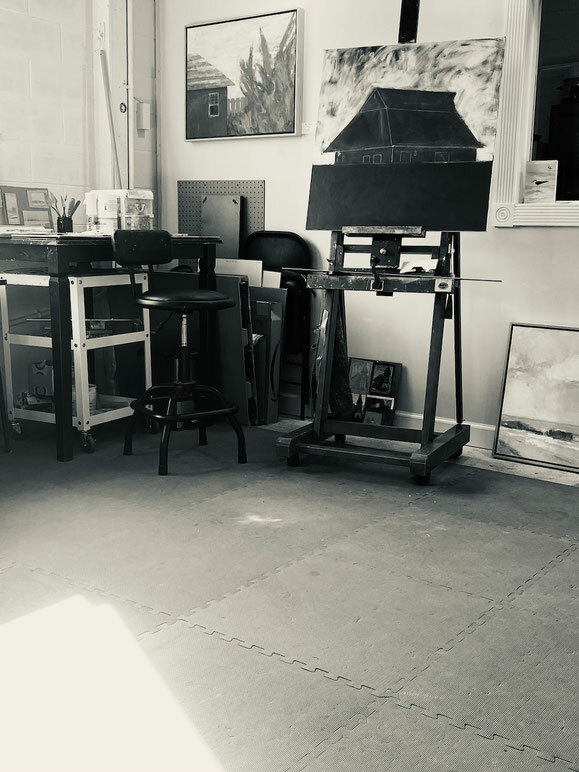 I currently paint in a studio at Liberty Town Arts Workshop in Fredericksburg, VA. I received my BA in art at the University of Maryland. My work has been shown extensively in the mid Atlantic region in juried shows and galleries and included in corporate and private collections.